JORD wooden watches provided me with the following wooden watch displayed in this post in exchange for a review. All opinions are my own. This post contains affiliate links. See my disclosure statement. I always have ideas for blog posts rolling around in my head. 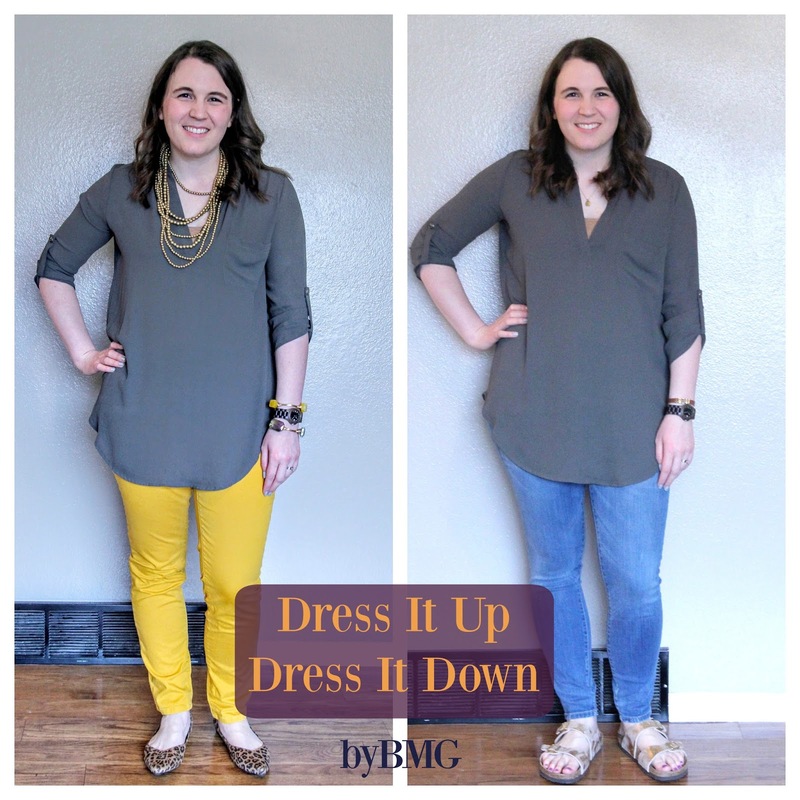 So, today I'm starting a new series I hope to post about once a month called Dress It Up, Dress It Down. I'll be taking one pieces from my closet and showing you a casual and dressy look. The ability to do this is very helpful to me since I have to dress up for work, but sometimes have things to go to after work that require more casual wear. I'm wearing the dressed up outfit to work today and the dressed down outfit to a girls' night tonight. Re-wearing the same piece not only saves time but laundry! Both wins in my book! I'm also sporting a beautiful wooden timepiece from JORD. JORD watches are hand-crafted watches made in St. Louis, Missouri. They carry a variety of styles and colors of wood watches for both men and women. I chose the Ely in dark sandalwood. Their collections feature bamboo, maple, sandalwood, blackwood, cherry, zebrawood, and koa woods which are sustainably harvested from around the globe. One of my favorite colors is mustard, and these mustard pants are always a winner in my book. I added some fun accessories. Jeans and Birkenstocks are always a comfortable win in my book. I've loved Birkenstocks for so long, but I love that they are gaining popularity again. Adding some simple jewelry makes this a classic yet casual look. I just LOVE this JORD watch. It is a beautiful timepiece with a natural look that looks great dressed up or worn casually. It is so light weight and was sized perfectly for my wrist. The style of this watch is fitting for everyday wear. With Mother's (and Father's) day coming up, a JORD watch would make the perfect gift! I'm linking up with Thursday Moda, and The Blended Blog, Party at My Place, Style Me Wednesday, and Favorite Things, Thursday Fashion Files.